Nanu Guesthouse Pink Hongdae i Seoul, Sydkorea: Reservér nu! Welcome to Nanu Guesthouse Pink! It is located in the lively Hongdae area as well as a lively university area. The property is 100 metres from the Hongik University Metro stop, making transport to the whole city easily accessible. Pink Guesthouse is 35 minutes via Metro from Gimpo International Airport and 1 hour from Incheon International Airport. 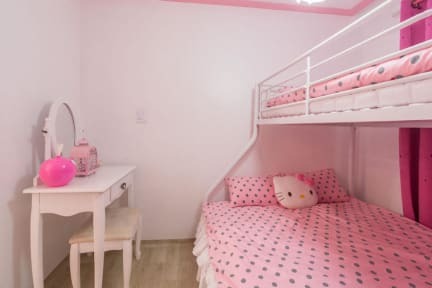 The rooms have been designed in a pink kitty style, some of them with special bunk beds that you can fold when there are no other guests so your room will be very spacious. Each bed has a designated locker. There are 3 bathrooms and 2 kitchen/living rooms to hang out and meet other travellers. All rooms come with both air conditioning and heating and have use of the shared bathroom.